For every woman out there who wants a little luxury in her life, Estee Lauder introduces the NEW Re-Nutriv Ultimate Diamond Transformative Energy Eye Creme for a rejuvenating daily ritual. Every day, morning and evening the massage begins with a luxurious rotating applicator developed specifically for Re-Nutriv. Made of a cooling golden alloy, the innovative, diamond-faceted wand features a finely crafted tip that rotates gently to stimulate skin, creating an extraordinary 360° sensation of absolute indulgence. The massage technique helps increase micro-circulation and re-energizes skin’s appearance. This luxurious ritual helps deliver visible results and skin that feels lifted and smooth. At its heart, this ultra-luxurious eye creme is infused with the ingenious combination of precious, energizing Black Diamond Truffle Extract and breakthrough youth-sustaining technologies featured in Re-Nutriv Ultimate Diamond Sculpting/Refinishing Dual Infusion and Transformative Energy Creme. With a single touch, the transformation begins. As only Re-Nutriv can, NEW Re-Nutriv Ultimate Diamond Transformative Eye Creme perfects the look of the eye area for a dramatically younger look. Intensely rich, yet lightweight, this ultra-luxurious eye creme lifts, firms, re-energizes, brightens the look of the eye area. Dark circles and puffiness look revitalized and refreshed. Eye area contours look strikingly younger, smoother, more sculpted, infused with a look of renewed energy. Deep in the forests of Southwestern France Black Diamond Truffles lie in wait, ready to be foraged and brilliantly transformed by Estée Lauder Scientists into the precious Black Diamond Truffle Extract that has an astounding ability to promote natural skin vitality to help create visibly younger, healthier-looking skin1. Infused in NEW Re-Nutriv Ultimate Diamond Transformative Energy Eye Creme, this precious, potent extract helps vividly renew and revitalize the eye area’s energized look. A revitalizing, brightening botanical-based blend of ingredients, including Marine Algae, Magnolia Extract and Japanese Apricot Fruit Extract, work in concert with one another to help target the visible signs of eye area fatigue for a more rested, re-energized and radiant look. The eyes are instantly brought back to lustrous life and the eye area appears naturally luminous, rejuvenated with ageless beauty. Re-Nutriv’s exclusive Black Diamond Truffle Extract works synergistically with a key component of our advanced youth-sustaining technologies to help promote more even-toned skin. Imbued with the, revolutionary advances in epigenetic-inspired skincare, including exclusive technology, NEW Re-Nutriv Ultimate Diamond Transformative Energy Eye Creme contains advanced youth-sustaining technologies that help support skin cells’ natural longevity and help fight the look of multiple pathways of premature skin aging helping rejuvenate the look of skin and sustain a more youthful appearance. So powerful, in vitro testing shows that these patent pending technologies actually help skin increase its natural collagen production by up to 215% after 72 hours3 while advanced lifting technologies help preserve and restore skin’s density. Over time, the eye area appears younger, firmer and more lifted. Dark circles and fine lines appear diminished, revealing an essence of beauty. Enveloping the skin in lasting, luxurious hydration, NEW Re-Nutriv Ultimate Diamond Transformative Energy Eye Creme refreshes the eye area after a single use. 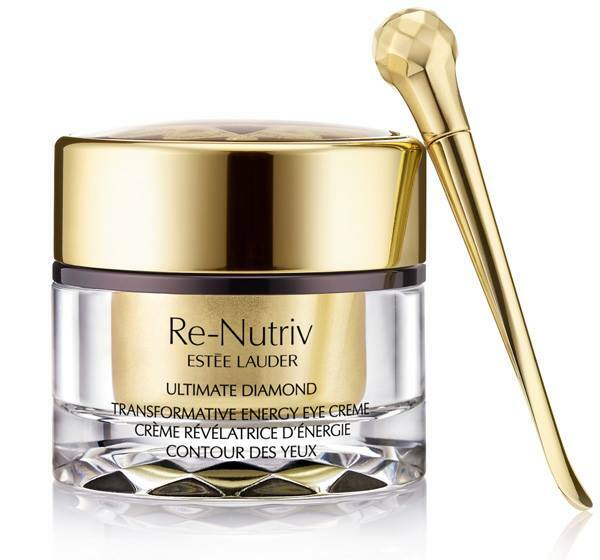 Applied with a luxurious, rotating applicator made of a cooling golden alloy specifically for Re-Nutriv, NEW Re-Nutriv Ultimate Diamond Transformative Energy Eye Creme offers a new facet of luxury. The skin surrounding the eyes is refreshed and perfected for a more lineless, firm, plump look. Over time, the eye area develops increased barrier protection and resistance to environmental factors that can accelerate aging. Refined 24K Gold along with powerful anti-irritants ensure that eye area skin remains calm, soothed and comfortable. South Sea Pearls and illuminating optics create an instant lustrous, radiant look. Applied with a luxurious, rotating applicator made of a cooling golden alloy specifically for Re-Nutriv, NEW Re-Nutriv Ultimate Diamond Transformative Energy Eye Creme indulges the eye area.